I’m sharing a CSA (Community Supported Agriculture) share this year from the organic farm at Washington State University with two friends of mine. I’m so glad they asked to include me, because it’s meant I’ve had more local fresh produce during the move than I otherwise would have, since planting an extensive garden at either place or getting to the Farmers’ Market every Saturday or Tuesday during the weeks of moving wasn’t a realistic option. I did plant peas and greens at the Asbury Street house, and tomatoes and greens at the Van Buren Street house, and I’m really glad I did. Nevertheless, it’s really fun to get a bag full of veggie surprises each Wednesday or Thursday. There’s always variety to experiment with and see what new flavor combinations I can play with. Last night I was very focused on using half of a long fresh zucchini that was in my share of the share, and using up a small bag of broken brown rice lasagne pieces and about a cup of Pomi no salt added tomato sauce left over from when Kelly made gluten free veggie pizza while the kids were here. That use-up-the-zucchini and make-marinara-and-pasta-with-leftovers meal turned out just fine, and I got to use everything up that I wanted to use. But the next morning I was looking through my bag of goodies and realized I had about a cup of fresh basil that needed to be used right away. I’d just eaten the last of any gluten free pasta I had in the house and hadn’t noticed the basil, so at first I was crestfallen about that. But then inspiration struck. Garlic won’t be harvested here until the Fall, but right now there’s lots of garlic tops, or scapes, available locally. 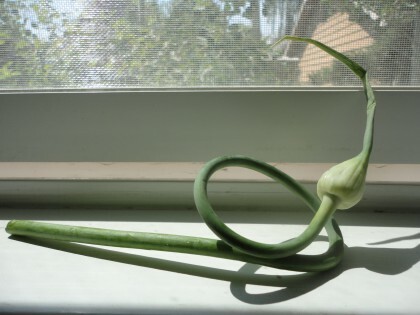 If you haven’t tried garlic scapes before, you are in for a real fresh treat. They are milder than garlic cloves, but oh are they ever delicious in things like sauces and stir fries. They’ve been my favorite “green” to put into my evening quesadillas. You can also chop them up and freeze them, dropping a handful into soups and stews all fall and winter long. I just bought a couple of bunches I plan to do that with. So I was delighted when I saw several curlicues of garlic scape inside the bag along with the basil. I decided to use those in my pesto creation instead of regular garlic cloves. In fact, many people around here make garlic scape pesto, with the scapes playing the role of the basil. And that’s pretty yummy too. I was going to make a basil version of Short Cut Vegetarian‘s spinach pesto but I wanted it to be unique. That’s when I had the inspiration to cut up some fresh pineapple and add it to the food processor. I have to say that inspiration was right on the flavor money. It went well with the lemon juice, the garlic scapes and the basil. And for a little saltiness I added some chickpea miso. My only regret is that since I only had a cup of basil, probably less (maybe 3/4 of a cup, if packed) it made just about a cup of pesto. Which I ate most of on my lunch salad. So before I forget what went into this one-of-a-kind seasonal-yet-exotic pesto, I thought I’d share it with you, and that just might mean I’ll remember to make it when the combination of fruit and veggies turns up in my fridge again. I bet it could be frozen and thawed too, which is a nice thought, since it would probably make a good pizza topping. Of course this pesto is only outstanding if, like me, you love fresh pineapple. I add it regularly to salads, cereal bowls, stir fries, and even pizza or soup. And it really makes a difference if it’s fresh. I guess you could use canned, but I can’t guarantee the same brightness of flavor and anti-inflammatory goodness. Chop up the garlic scapes and roughly chop the basil, too, if you want, and process them in the food processor a little bit. Add the walnuts and process a little more. Add everything else and process until it holds together in a pesto kind of way. I left mine with small chunks of everything instead of processing it until completely smooth. 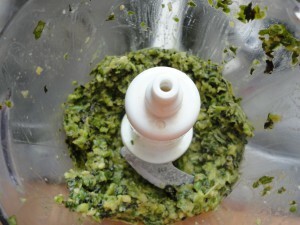 Notes: I think you could use cashews in this pesto to delicious effect instead of the walnuts, if you prefer. If you don’t like pineapple, a good mango or ripe peach or nectarine might be an interesting substitution. The measurements are approximations, but they should work. I think this would make a really nice pesto for a pasta salad, but since I don’t eat pasta all that often, I just put it into my black rice and vegetable salad bowl. I added a little extra lemon juice and a smidge of flax seed and garlic granules and tossed the romaine in it, then added the black rice, the pesto and some veggies from the CSA–carrot, turnip, cucumber, green onion and zucchini. It was ambrosial. Made me forgot how hot it is outside. This sounds so good! And your salad bowl at the end, too! 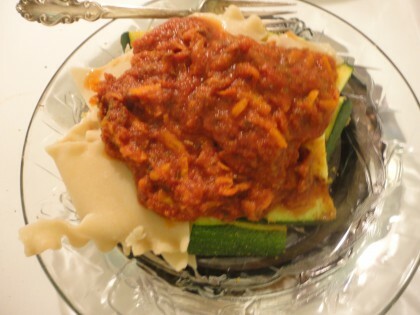 I love to combine the things in my fridge that need to be used up … It usually turns out yummy! Thank you Carol, and welcome! I’m glad the salad bowl looked good to you too. It’s really fun to combine what needs to be used up, isn’t it? That looks great! I really like the integration of pineapple into the pesto – it brightens and summerizes a classic. I’m glad you’re liking the CSA! I fell in love with ours last year; I’ll have to find one near my new place, too! I had to look up garlic scapes since I’d never heard the term. I’ve never seen them in the grocery store…what would be a good substitute? Welcome Linda! You can just use garlic cloves instead, or a combination of garlic and green onion greens might be really good too. Thanks…that’s what I was thinking. The combination of garlic cloves and green onions sounds good. 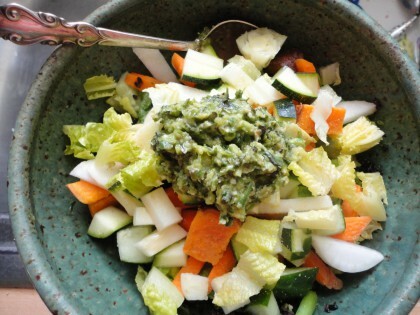 I’m going to try this recipe…I love basil, but so many of the vegan pesto sauces have oil! Glad this sounds like a good suggestion–hope you enjoy your version, Linda! Great post as usual Maria – so was the last one : ) I hope you’re settling into your new home. Does Romeo like his new home? interesting to see what eventuates – must look out for those scapes. I have bought some a long time ago and quite liked them. I was just thinking I have lots of garlic chives in the garden,they are so lovely in a salad and quite mild – maybe they would be a good substitute for the scapes. Once you have garlic chives in the garden,they keep on growing and seeding so there will always be some popping up somewhere. Thanks, Angela! Yes, we are both settling in–Romeo’s doing a LOT of smelling and “leaving messages” on our exploratory walks. he’s a pretty cautious guy, but all in all he’s getting pretty comfortable, too. 🙂 I think using garlic chives would work great. Since they are smaller, I would use more though–whatever suits your taste buds is what will work!